We live in an age of fakes. But it seems that all those fake stories and photos that we see swirling around the internet are somehow getting even worse. Did you hear about the guy who brought a gun to a DC pizza shop because of a conspiracy theory he read online? 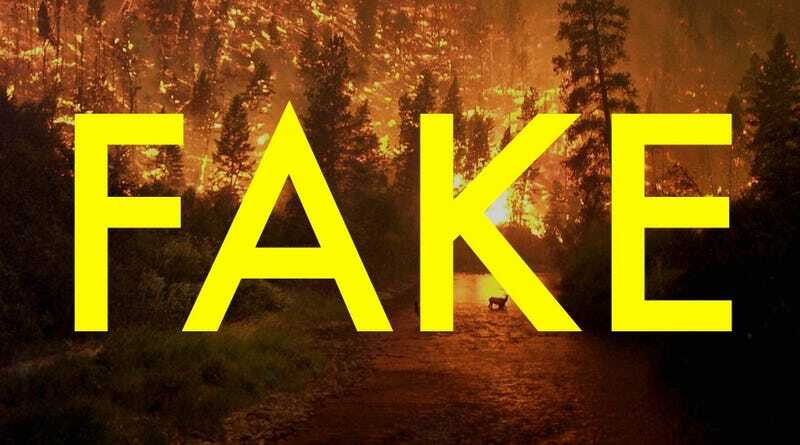 Yes, the internet’s fakes bleed into the “real world” all the time. Here are just a few of the fake photos you may have seen circulating recently. 1) Is this a photo from the fires in Tennessee? The wildfires in Tennessee have devastated communities, scorching over 17,000 acres and leaving 14 dead so far. But this photo you may have seen doing the rounds isn’t from Tennessee. It’s actually from Montana. And it’s 16 years old. There are a handful of photos that seem to circulate when natural disasters hit. When a hurricane strikes, you’ll often see those infamous photos of sharks in the streets. And when a fire hits, you’ll often see this photo pop up. The photo shows two deer in a river, protecting themselves from the oncoming flames. But it was taken in the year 2000 in Montana. Anyone who insists otherwise is spreading fakery. 2) Is this an ironic photo from the College of Architecture and Planning? Yes, this photo is hilarious. But it wasn’t a mistake. As Chris Helms explains in a YouTube video, the photo from Ball State is authentic. The sign was constructed as a joke when they built a skybridge connecting two buildings. But the sign was eventually torn down and isn’t something you can visit anymore. So what am I debunking? The “original” photos are actually the fake ones. Take a look at the photo below, which people pass around as the “real” photo. But it’s actually the fake one. You can’t even trust debunkers these days. 3) Is this Stalin and North Korean dictator Kim Il Sung? As photo debunker HoaxEye points out, the original photo shows Kim Il Sung and Zhou Enlai, the first Premier of China. It’s unclear if Stalin was added more recently or if this is a fake that predates Photoshop. Either seems plausible. But all we know for sure is that this is a phony. 4) Is this a photo of Elvis and Bruce Lee? We turn again to HoaxEye who notes the original photo doesn’t show Bruce Lee at all. The unaltered version on the right shows a man named Wayne Carman. This photo of Elvis, on the other hand, is completely real. 5) Is this secret footage of a giant in Japan? No, this isn’t secret footage from the 19th century showing a race of giants that were living in Japan. Conspiracy theory sites have had a field day with the footage, claiming that it’s proof positive of giants. But, as the debunkers at Snopes point out, it’s actually from a 2007 movie called Big Man Japan. 6) Is this Hillary Clinton looking extremely ill? Throughout the election campaign, there were countless fake photos circulated online. And none were more popular than fake photos of Hillary Clinton. This photo, as just one example from the conspiracy theory site InfoWars, is totally fake. As Brendan Karet points out on Twitter, the photo of a haggard looking Clinton was manipulated by InfoWars, which then published the doctored photo. The real photo was published in the Wall Street Journal in 2015. “Your reputation is amazing. I will not let you down,” Trump told Alex Jones in December of 2015. 7) Is this a super moon rising over a FedEx plane? Nope. Not even a little bit. It’s 100 percent fake. You can tell because if you open your eyes........... it looks fake as hell.